Known as Yébîchai in Navajo, the Nightway is a ceremonial that lasts nine nights and is performed by a singer to heal a patient, although family members and friends are often present in the hogan, along with the Holy People, for the healing. The Nightway includes singing, dancing, pollen blessing, sandpainting, sweating, and other offerings and rituals. This is one of the only ceremonials occasionally performed in public, but the patient decides which parts of the Nightway are private and which are left open. On the last night, masked dancers appear dressed as "yei", or spiritual beings to conclude the ceremony. The three figures are medicine-men, or singers, chanting. 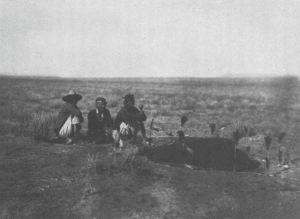 The patient lies under the blankets surrounded by a line of sacred meal in which turkey-feather prayer-sticks, kadán, are implanted. By Harold Carey Jr.
2012 "Yei Bi Chei (Yébîchai) Night Chant-First Day." Navajo People Culture and History. http://navajopeople.org/blog/yei-bi-chei-night-chant-first-day/, accessed June 17, 2014. 1987 Navajo Medicine Bundles or Jish: Acquisition, Transmission, and Disposition in the Past and Present. Albuquerque: University of New Mexico Press. 2000 Encyclopedia of Native American Religions. New York: Checkmark Books.